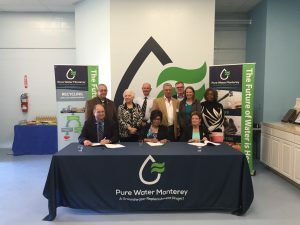 This week, the Water Management District completed a historic water purchase agreement with the Monterey Regional Water Pollution Control Agency and California American Water. 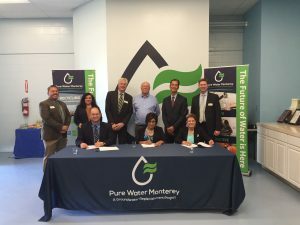 This three-way agreement will allow for the purchase of highly purified potable water from the Pure Water Monterey Advanced Water Purification Project which will then be injected into the Seaside Basin, augmenting the existing adjudicated groundwater basin and helping to prevent additional seawater intrusion. This water can then be extracted by the local water supply company for delivery to it’s customers. The agreement is historic in nature as it is the first of its kind in our region and is the primary step towards establishing a new water supply and satisfying the State Water Resources Control Board’s Cease and Desist Order. The agreement also shows the cooperative nature of the parties which has been the bedrock of the project’s success. 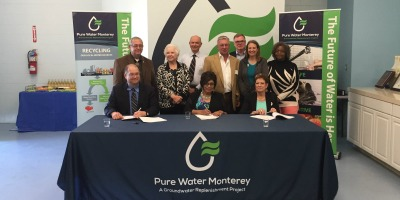 The Water Management District is proud to be part of this milestone in the region’s quest for water supply security.